08/31/99 Hello, my name is Kamaya and I will be taking over from Veralden as the section maintainer. For the time being the site will remain the same but when I have some more time, I will completely update the whole section. If you have any comments, requests or suggestions do not hesitate to contact me here. 04/09/99 Sorry, I am busy. But there is a new BrSMS 1.19 out, I edited the emulator page, and the P.A.R.chive has a new color scheme. 04/05/99 Added MEKA, a faboo new SMS/GG emulator. I will post a review probably on Thursday. I will start doing in depth reviews, starting with MEKA and then going on to the others. 03/30/99 Added two more .MSD Save States-Golden Axe Warrior and Prince of Persia. And always, if you have any, just send them to me. 03/09/99 A Phantasy Star Gaiden patch from Magic Translation. And it is complete! Dowload it here or their site. Emulator Help - Having trouble running the latest and greatest emulator? Read this document of tips and advice. It contains answers to the most common questions asked. Emulator Help - Frontends can help make using that annoying DOS-propmt game easier. A nice convience. .MSD Save Archive - Donate and take your Massage save states here! Screen Shot Comparison - A simple page to compare the graphical emulation of all SMS/GG emulators. Sonic Games and Stuff - Looking for Sonic the Hedgehog games? Look no futher then this section. Utilities - Games, game sites, translations, utilities, you name it. If it deals with the SMS/GG and it can be downloaded, then it's in here. And Finally... - Have some time to waste to hear a rant? 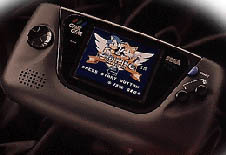 Info: In retaliation to Nintendo's portable Gameboy, Sega cameout with their own portable game unit in 1991. The key feature that Gamegear has that Gameboy doesn't have is a passive matrix color screen! But, unlike Gameboy, which has an average battery life of 6 hr+, Gamegear only acheived an average battery life of only 2 1/2 hrs. Info: Though similar to the NES, this unit has a more realistic color pallete and, overall, just better graphics quality then the NES. Even though superior to the NES, this system was never really able to top the NES's popularity. This created a rivalry between Sega and Nintendo that still exists today. 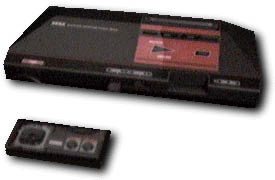 Sega later released the Genesis system, which became their flagship game system, ending the SMS time period.